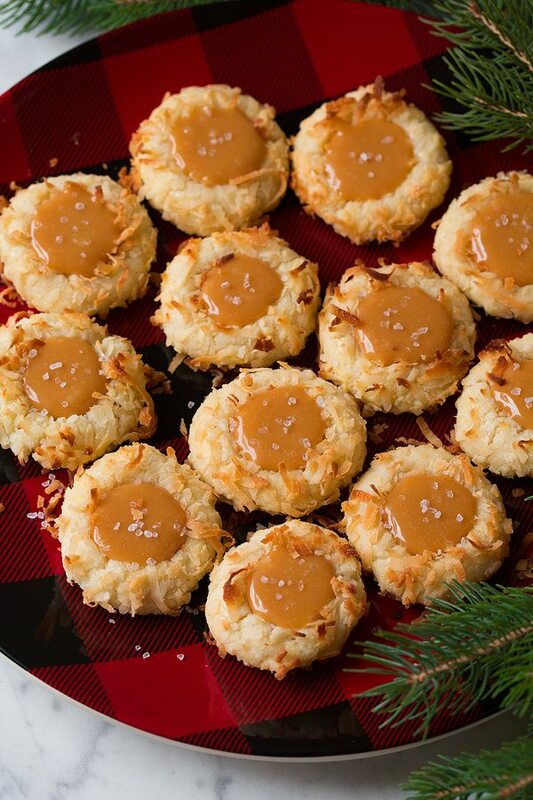 If you only have time to make a couple of cookies this holiday season, I’m telling you these Salted Caramel Coconut Thumbprint Cookies had better be one of them! 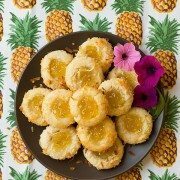 I mean I normally have a really hard time picking favorites but these cookies are definitely one of the best I’ve made this whole year and that’s saying something because I’ve made a lot of cookies I’ve really, really loved. There’s just something about these though. 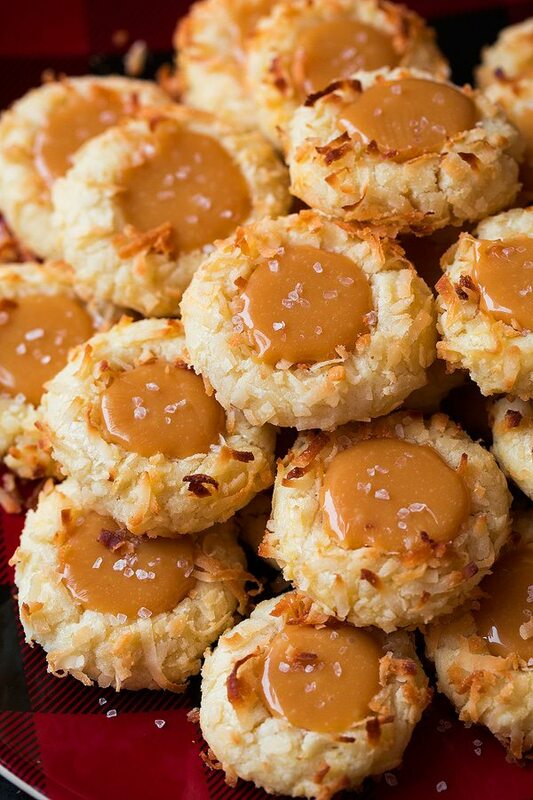 The coconut, the salted caramel, the melt-in-your-mouth buttery goodness. These cookies speak to me. In other words someone please hide them! I just had to quickly take most of them to neighbors because I knew I couldn’t resist these ones (then I later heard from my neighbor that she hid them away for herself lol. She had the same problem as me). There are a few extra steps with these since they need to be rolled, indented and filled but those couple of extra steps make them an over-the-top, worthy of any holiday, kind of cookie. To keep them things from getting too messy, I like to use one hand for rolling in the egg, then the other for rolling in the coconut – kind of like when you bread chicken. Another thing that helps is to press the coconut onto the cookie to help it adhere, if you just roll it through the coconut it doesn’t stick all that well. And I chose to just chill these cookies directly on the baking sheets, but you can definitely chill them on plates or in containers if you don’t have room for two sheet pans in your fridge. Then just transfer them to the baking pans after they’ve chilled and bake as directed. Obviously a highlight of the cookies is the course sea salt. 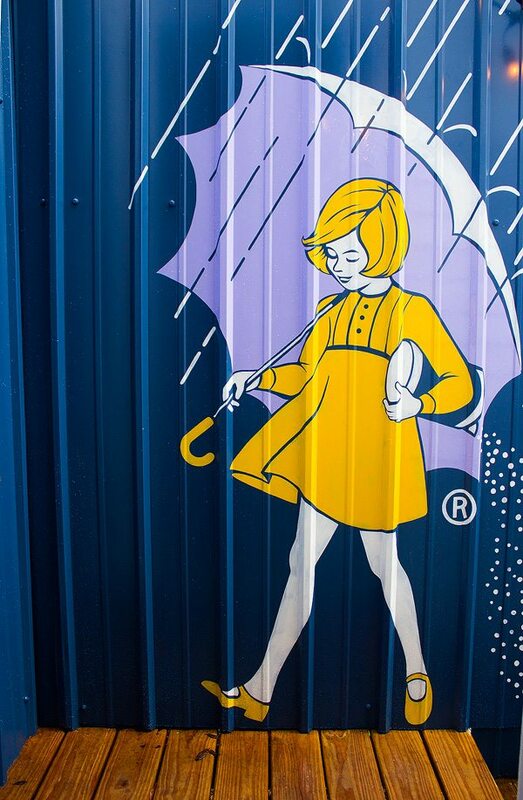 I’ve got salt on my mind lately since last week I had the opportunity to attend Morton Salt’s Next Door Chef event in New Orleans along with several other guests. 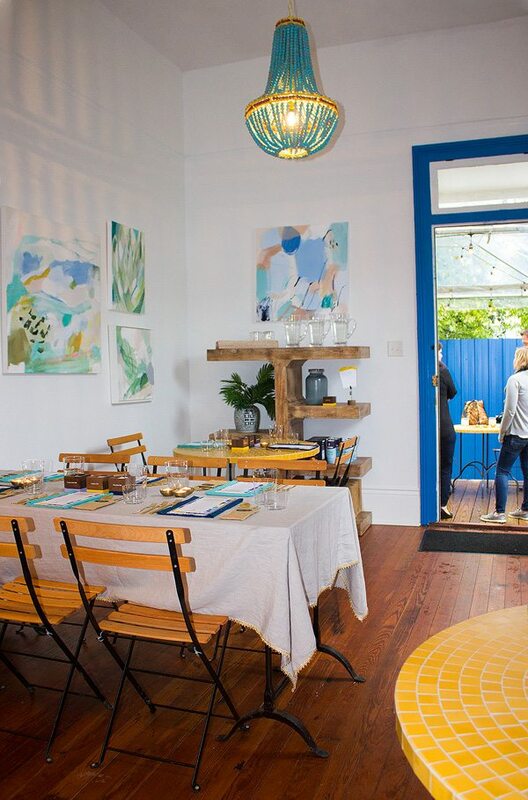 It was a fun dinner experience where they converted someones home into an actual pop-up restaurant for a day. Below is a few sneak pictures of the event. I’ll be sharing more in the coming months so be sure to keep a look out for more. I think I might even have to share that Budino recipe! 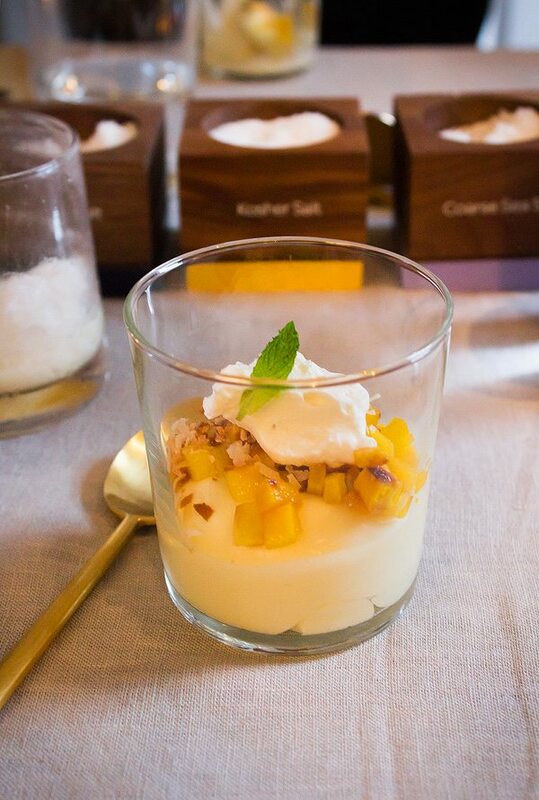 Of course, my favorite part of the meal was the Coconut Caramel Budino with Grilled Mangos and Morton Kosher Salt which was served for dessert. It was dreamy so I knew I needed to use that combination again to make something for the holidays, and that’s how these cookies came about. Acclaimed chef Nina Compton coached a home cook and then this cook prepared an incredible meal for us in which different types of Morton salt were used. At the event we tried a number of inspiring dishes where we could taste how different types of salt transformed each dish, from appetizer and drinks, to side dish, to the main dish and then onto dessert. 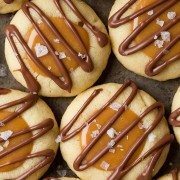 Tender buttery thumbprint cookies are coated with sweet shredded coconut and filled with salty decadent caramel. Such a delicious cookie recipe! For the cookies: Preheat oven to 350 degrees. Line 2 baking sheets with parchment paper or silicone baking mats. Add coconut to a small mixing bowl. Add egg to a separate small mixing bowl and whisk well until blended. Set aside. Add butter and sugar to the bowl of an electric stand mixer fitted with the paddle attachment. Sprinkle fine salt evenly over butter and sugar then mix on medium-low speed until well combined. Mix in coconut extract. With mixer on low speed slowly add in flour and mix just until combined. Scoop dough out in 1 even tablespoon at a time and shape into balls. Roll each dough ball in egg mixture then in coconut mixture (press coconut onto cookies to help it stick better). Transfer cookies to prepared baking sheets spacing at least 1-1/2 inches apart. Make indentation in each cookie with thumb or forefinger. Transfer baking sheet to freezer and chill for 10 minutes, or refrigerate 30 minutes. Transfer 1 baking sheet to oven and bake for 10 minutes. Remove from oven and re-indent cookies using the back of a rounded 1/2 teaspoon*. Return cookies to oven and continue to bake 6 - 9 minutes longer until the coconut is golden brown on edges and cookies have baked through. Cool on pan for several minutes then transfer to a wire rack to cool completely. For the caramel filling: Add caramel to a medium microwave safe bowl. Pour in cream. Heat mixture in microwave in 30 second intervals, stirring well between intervals until melted and smooth. 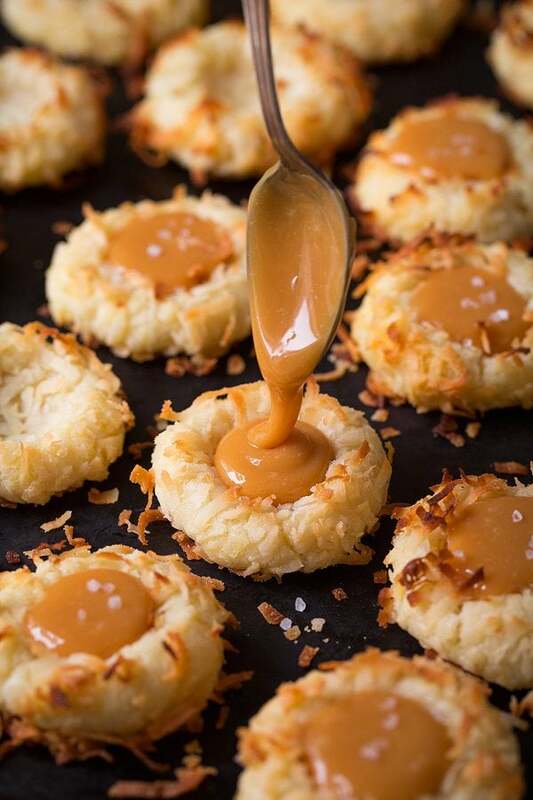 Spoon caramel into indentations in cookies. 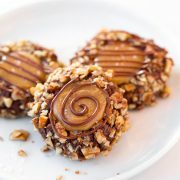 Sprinkle caramel lightly with sea salt before it starts to set. Store cookies in an airtight container at room temperature. 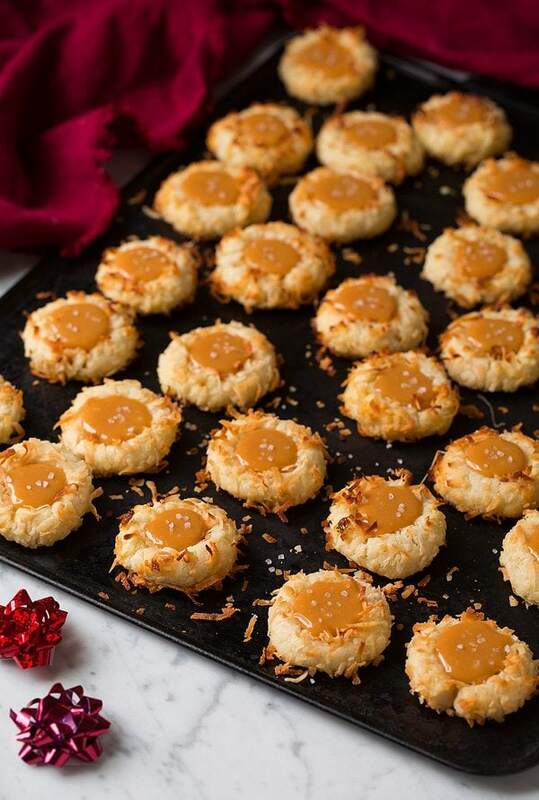 At this point, if the coconut is browning too much your oven probably cooks too hot, but you can just tent the cookies with foil and proceed as directed. This post was sponsored by Morton Salt. All opinions are 100% my own. Carolina: Hola.. me encontre con tu receta y me encantaron tus galletas!♡ solo una pregunta se puede cambiar la harina de trigo por otra sin gluten? Paige: These cookies look amazing! I love anything with coconut!